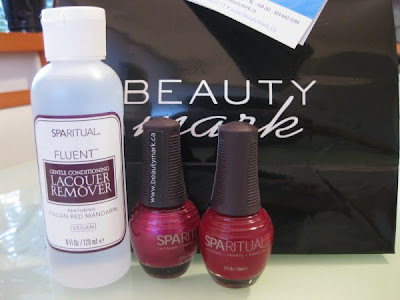 After seeing my review of butter LONDON nail polish, the generous folks at local boutique BeautyMark offered me the chance to try one of the other brands they carry: Spa Ritual. Spa Ritual products are vegan (which means they contain no ingredients derived from animals) and their nail polishes are free of toluene, DBP, and formaldehyde. I deliberated over the gorgeous selection of colours and chose Kiss the Cook (a creamy deep red) and Drop Dead Gorgeous (a shimmery medium berry purple). BeautyMark threw in a complimentary bottle of Gentle Conditioning Lacquer Remover as well. If there's such a thing as a perfect nail polish, Spa Ritual might be the closest thing to it. Aside from the 3-free vegan formula and selection of beautiful colours, this nail lacquer also boasts superior chip resistance. Five days passed before the first chip appeared in my manicure, after which the chipping accelerated until I removed the polish at the 10-day mark. As usual my pedicure held up much better and lasted for 2-3 weeks. The formula is creamy and pigmented enough to provide decent coverage with one coat, although two coats are required for a flawless look. I liked the soft rubbery grip on the brush and the fact that the brush wasn't too small or too wide, allowing for precise application in a few strokes. And the polish remover? I usually have a problem with dry nails, but it left my nails in better shape. Spa Ritual polishes retail for $16 Cdn while the remover sells for $6.50. It's expensive compared to other brands but completely worth it. Thanks to BeautyMark for letting me try these products! That's a delicious shade of Red. Five days would be a record mani for me! Thanks for the awesome post Lisa! :) I love all things nail polish and can't wait to try this brand too! I agree. I'm a huge fan of Spa Ritual. Wow, I'm so glad I found this blog as well as type of nail polish. I too visited a boutique recently. They were selling these for $1/each!! I'm so far loving them. Wow, I'm so glad I found this blog as well as brand of nail polish! I too visited a local boutique a few days ago and found that they were selling these for $1/each!! I'm so far loving these. My bridal party an I just had manicures and pedicures in a salon that used this brand this nail polish took over 8 hours to fully dry...meaning all of our nails were ruined before the wedding except my own which were ridiculously chipped and cracked by day 3 and had to be removed.